Lipstick Shaped Flash Drive | OhGizmo! It seems some people think that if you make a gadget in the shape of a lipstick, women will flock and purchase. First, there was the lipstick shaped MP3. And now, we have a 128Mb USB2.0 flash drive that works with Macs, Windows and Linux. Yeah. Buy it here. It’s 11£, which is about 20 delicious American pies. Story VIA Shiny Shiny. So what, they make something in pink and say it’s shaped like a lipstick and BAM! it’s for the ladies? Are we that stupid? What a great idea, especially for the women. 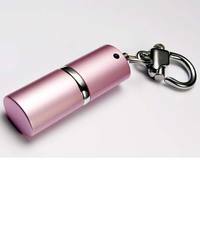 A pink flash drive that is disguised to look like a lipstick keyring.